Mother Nature has blessed Gujarat with some of the best sights and sounds. Here one can see many treasured plant pavilions and gardens that are much more than an attraction for tourists; they are the great resource for plant conservation education as well. Additionally visiting them can be a good fun as many of them offers recreational activities for a fun family outing. Inspirational, uplifting, educational and gorgeous; a visit to the gardens of Gujarat should not be missed. To begin with the finest gardens in Gujarat, the first one in the list will be Sharad Baug Palace in Kutch. Part of the Sharad Baug Palace, the garden creates a full-sensory experience, with scenic pathways, and movie-worthy bridges and terraces. One of the finest nature parks in India, Indroda Dinosaur and Fossil Park spread over an area of 200 km houses a zoo, botanical garden, Fossil Park and above all the second largest hatchery of dinosaur eggs in the world. Tourists who want to explore more can make their way to Mangalya Van, a unique Rashi Van' (astrological garden). In Mangalya Van, one can see how plants react to different sun signs. Kadaiya Lake Garden in Gujarat is yet another amazing tourist attraction. Everywhere one looks, they can see beautiful blooming flowers and creatively carved corners. Artificial lake inside the garden is famous for boat riding and many other recreational activities. Another park that deserves the attention of the tourists is the Waghai Botanical Gardens. This biodiversity and conservation park is famous for its assorted variety of plants that possess medicinal properties. 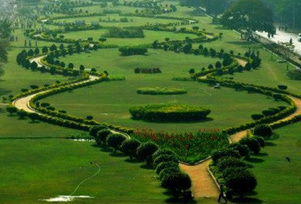 Also, there are many gardens, which are famous amongst trippers and wayfarers namely Sardar Patel National Museum in Ahmedabad, Pratap Vilas Palace and Peter Scott Nature Park in Jamnagar, Sarita Udyan in Gandhinagar, Jubilee Garden in Rajkot, Waghai Botanical Gardens in Surat, and Sayaji Baug in Vadodara. Gardens and parks in Gujarat are so much more, they are restaurants, the sun pavilion, heritage gardens and the list is endless. Tourists are advisable to spare a day to roam the Gardens with your family and friends and see harmonious life can be. Indroda Dinosaur and Fossil Park in Gandhinagar has the second largest hatchery of dinosaur eggs in the world. The park was founded and run by the Geological Survey of India and is the only dinosaur museum in the country.